WASHINGTON — Pitchers and catchers report to spring training Thursday, although it will be another seven weeks before actual baseball is being played at Nationals Park. But just up the road in College Park, baseball season has already begun for another team with designs on making its first-ever World Series. The Maryland Terrapins opened their season with wins over Old Dominion, Canisius and Western Kentucky at the Caravelle Resort Tournament in Myrtle Beach, South Carolina, last weekend. Ranked 20th preseason by USA Today and 16th by Baseball America, the Terps have one more tournament this weekend in Mobile, Alabama, before beginning their home slate on Feb. 24 at home against VCU. 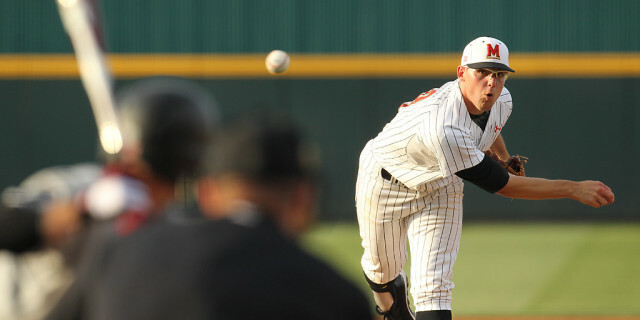 Maryland very nearly shocked the college baseball world last year, taking the University of Virginia to the brink before dropping the rubber match of their Super Regional series. The loss left them a win shy of reaching the school’s first-ever College World Series. That performance, along with their balance this season, is why Aaron Fitt and leading college baseball site D1Baseball.com ranked the Terps higher than anyone else (14th) coming into the year. The Terps are coached by John Szefc (pronounced “chef”), in his third year at the helm. Szefc is 70-48 through his first two seasons as skipper, netting the highest two-year win total in the history of the program. Szefc believes in pitching and defense first, and brings an aggressive baserunning approach that puts pressure on defenses and led to the second-highest stolen base total in the ACC, 30th-best in the country, last season. While they lost leading base-stealer Charlie White to the MLB Draft, Szefc doesn’t expect to lessen his aggression this season. While Szefc lost four players to the draft and has just two seniors on his roster, there’s still a lot of experience. Many of the juniors that compose the core have played since they were freshmen and gained invaluable postseason experience during last year’s deep run. One of those guys is Friday night starter Mike Shawaryn, a 6-foot-4-inch righty who steps into the role of staff ace in his second year. And while they are still figuring out their Sunday starter, that’s more a result of a surplus of talent than a dearth of it. That makes Maryland a preseason favorite to win the Big Ten. Of course, the talent level within the conference is a step down from the ACC, which ranked third in RPI among conferences last season (the Big Ten was 10th). That’s why Coach Szefc has scheduled as many quality nonconference opponents as possible throughout the season. The Terps face a big test against Arkansas this weekend, and host perennial power Cal State Fullerton for a three-game set in mid-April. Szefc hopes those challenges will give them a resume to put them in position to return to the success they enjoyed last season, and possibly more. And while the prospect of a first-ever trip to Omaha and the College World Series flickers in the distance, it hasn’t been posted on the bulletin board as the be-all, end-all. They’ve already made a believer out of Fitt.